Spring is finally here, and we're now in the home stretch of our school year, as we focus on mastering those last lessons... and preparing for one of my favorite days: high school graduation. I'm happy to share plenty of good news in this month's newsletter, including an update on the legislative issues we tracked until the final hours of the session last week and a new initiative to raise awareness of the dangers of vaping and e-cigarettes. We're very thankful to report that the proposed State legislation that caused us the greatest alarm - a threat to our "balanced calendar" in the form of a mandated statewide school calendar and "Education Savings Account" vouchers for private schools that would sap critical funding for public education -- both failed to muster enough support to pass. As the General Assembly is on a two-year cycle, we do anticipate these proposals may come back again next year... and we will keep you informed. Bottom line: our 2019-20 school calendar will not change from what the School Board approved last year. 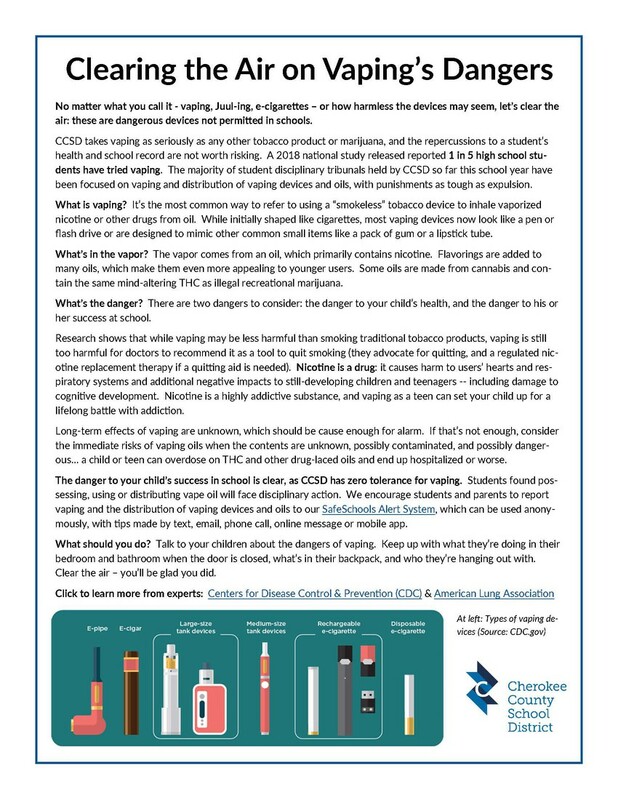 No matter what you call it - vaping, Juul-ing, e-cigarettes – or how harmless the devices may seem, let’s clear the air: these are dangerous devices not permitted in schools. Over the past year, we've stepped up our efforts to raise awareness among students about the dangers... and we need your help. Below you'll find a factsheet about vaping that we're also posting on our website and social media platforms -- please join us in sharing it to raise awareness throughout our community. We'll next be developing a new informational video for all middle and high school students to watch in class (we'll provide you with a link as well) and, through our CCSD Police Department's Parental Awareness for Safe Schools (PASS) initiative, developing a program to present at parent meetings in partnership with the PTA. 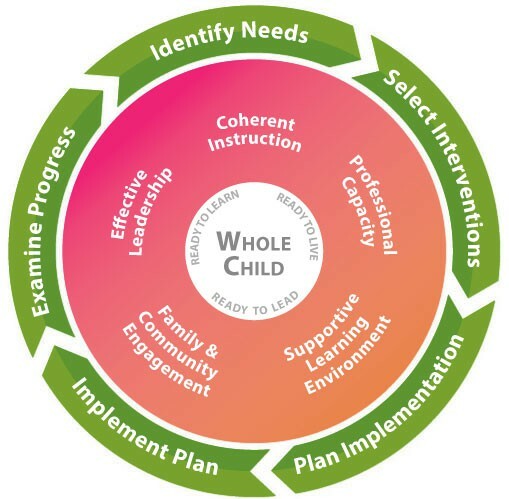 When I was honored to begin my service as your Superintendent, one of my goals was to create a recognition program focused on instructional excellence. This spring, I began presenting the third annual Game Changer Awards, which recognize four honorees each year: Instructional Excellence for a CCSD classroom teacher, Instructional Support for a CCSD staff member, Instructional Leadership for a Principal or CCSD administrator, and Instructional Advocacy, which recognizes a CCSD employee or a community member. So far, I've awarded the Instructional Excellence honor to E.T. Booth Middle School eighth-grade teacher Amy Loiselle (who's pictured above with me) and Instructional Support to CCSD’s Supervisor of Digital Learning Joy Silk. You can learn about them both here... and watch on our social media and website for my surprise presentations to two more outstanding honorees. 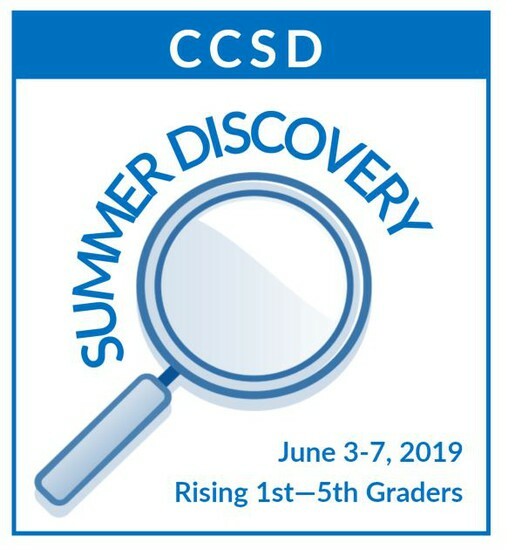 CCSD Summer Discovery Now Accepting Applications! 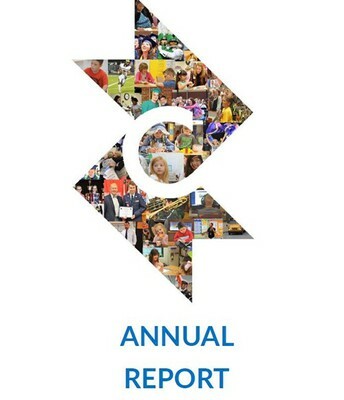 CCSD's 2018 Annual Report of District Progress showcases student achievement and system accountability across multiple metrics and also includes financial and demographic data. Learn more about your School District's successes and progress through this quick but informative read summing up data released by CCSD and the State over the past year. Join the School Board in celebrating the CCSD School Police Department for its 20 years of exemplary service! Led since its establishment by Chief Mark Kissel, the Department consists of 20 Georgia Peace Officers Standards and Training Council-certified officers and staff. Learn more about this award-winning department. 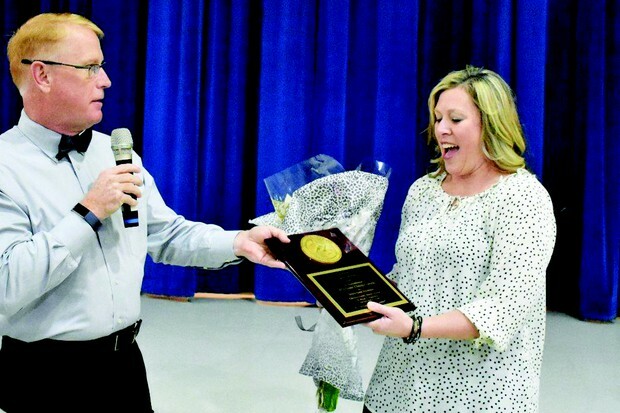 The Cherokee County School District celebrated the important role of support staff at its inaugural Support Staff Employee of the Year Awards in March. 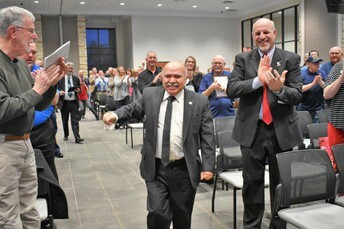 The celebration honored one Support Staff Employee of the Year from each of CCSD’s schools, centers and central office divisions. 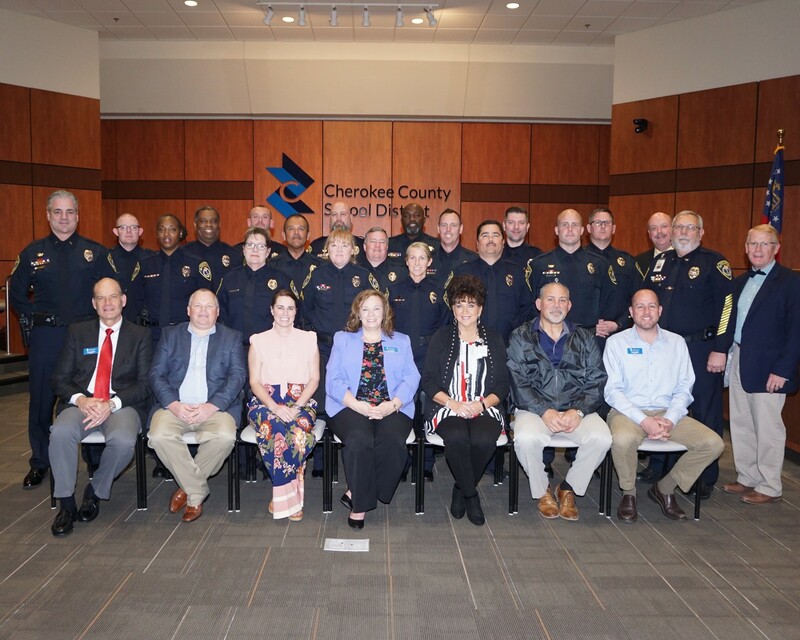 The 46 honorees were recognized by the Superintendent of Schools and School Board members, enjoyed a reception with their family and CCSD leaders and received a plaque and gifts funded by presenting sponsor, Cherokee County Educational Foundation, and other generous sponsors. 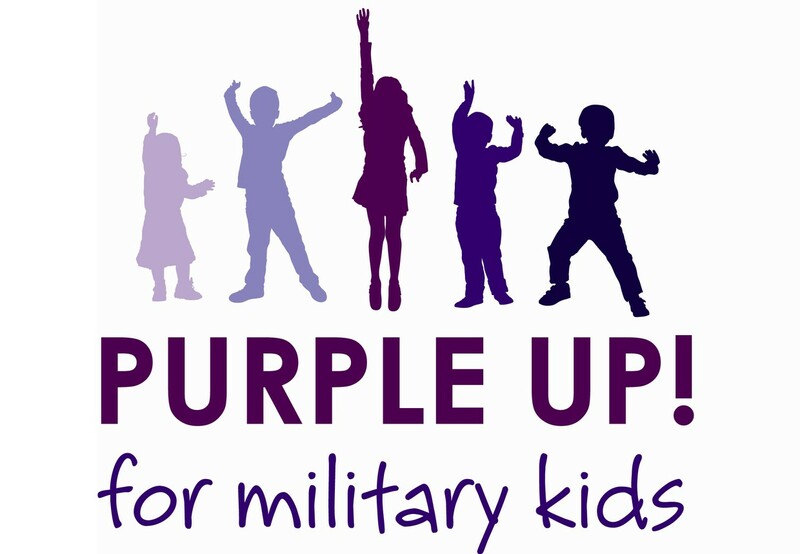 Learn more -- including who was recognized from your child's school! CCSD Celebrates Partners & Volunteers! CCSD celebrated outstanding school partners and volunteers at its Partner of the Year and Volunteer of the Year Recognition Ceremony. 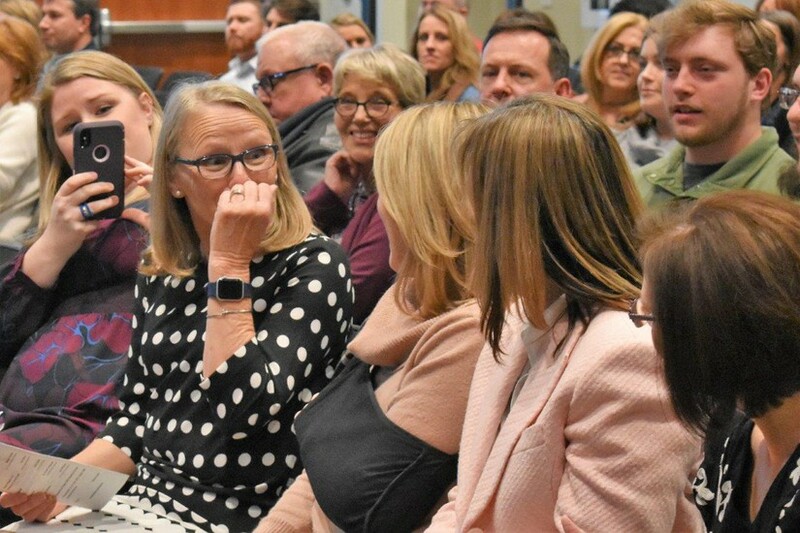 The event recognized honorees from each school and center and included the surprise announcement of the CCSD Partner and Volunteer of the Year. 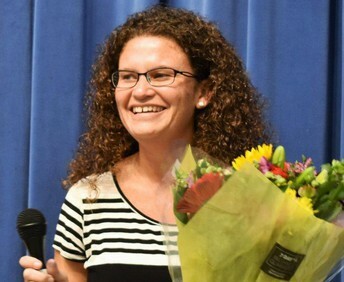 Indian Knoll Elementary School Counselor Colleen DeLosh deeply understands the struggles of the students she serves and her success in supporting the individual child led to her being honored as CCSD's 2019 Counselor of the Year. Learn more about her here. CCSD students excelled at the Student Technology Competition, with 53 placing 1st at Regions and six placing at State! The statewide program includes 16 categories of competition (like Mobile Apps, Internet Applications & Digital Game Design!) for Grades 3-12. 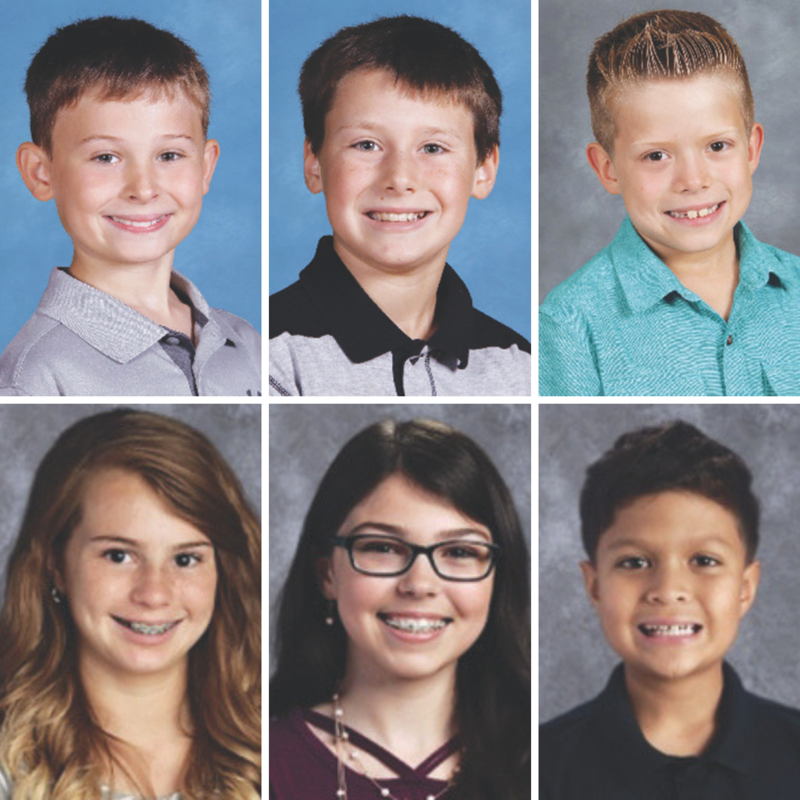 Learn more here... including names of CCSD champs! 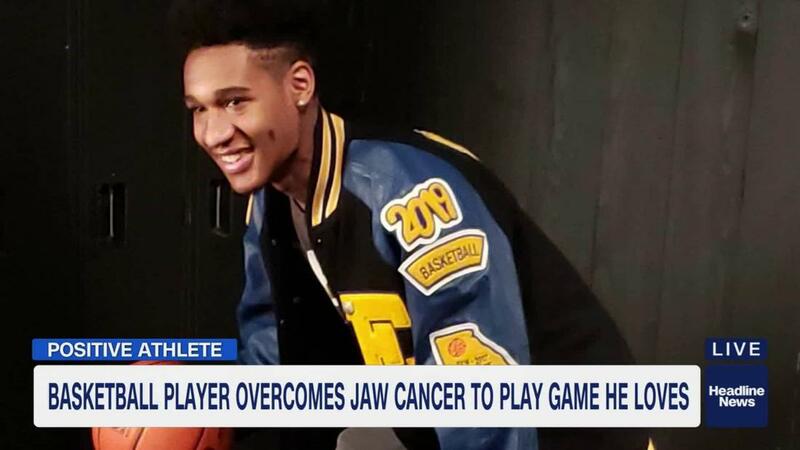 Matthew Lane, a senior basketball player from Georgia overcame jaw cancer and now uses his story to inspire others. 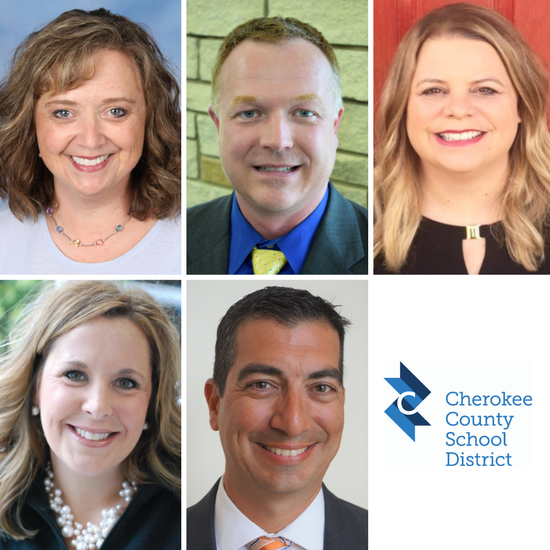 The Cherokee County School Board at its March meeting approved the appointment of five new Principals to fill vacancies for next school year. The five new Principals are: for Clayton Elementary School, Carrie O’Bryant; E.T. 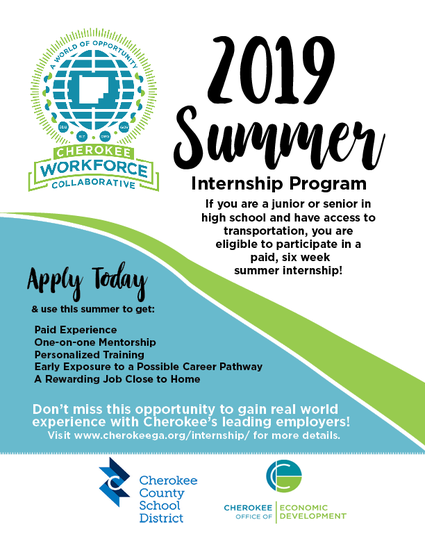 Booth Middle School, Todd Sharrock; Knox Elementary School, Jennifer McIntosh; Sixes Elementary School, Dr. Ashley Kennerly; and Woodstock Middle School; Michael Santoro. The five new Principals enjoyed a meet-and-greet reception with the School Board, Superintendent and senior staff prior to the School Board meeting, which was sponsored by Children’s Healthcare of Atlanta. CCSD's award-winning School Nutrition department each month will share a recipe from a school menu item in the CCSD Connections newsletter and on its website. The Department has earned State and National recognition for its use of farm-fresh ingredients (some even grown in school gardens!) in homemade recipes served at all schools. 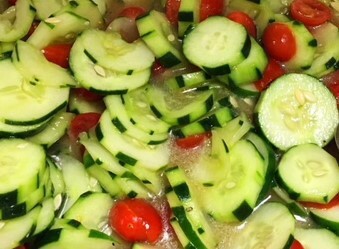 Check out this month's recipe for Cucumber Tomato Salad! Registration begins May 1 for CCSD's high school summer school programs, which offer students the opportunity to make up credit -- and to get ahead! The popular summer Personal Fitness and Health program for incoming freshmen will be offered again... many choose this option to free up room for more AP classes or electives (current HS students also are eligible). Learn more here. 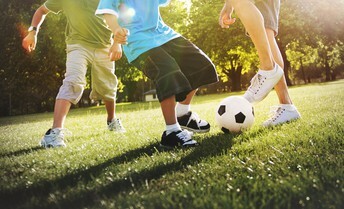 Share Your Input With Us! Parents are invited to share their input as part of CCSD's annual Comprehensive LEA Improvement Plan (CLIP) Review, which surveys parents on how well schools serve students with special needs (economically disadvantaged, disabled, learning English as a second language, etc.) in order to further improve services. 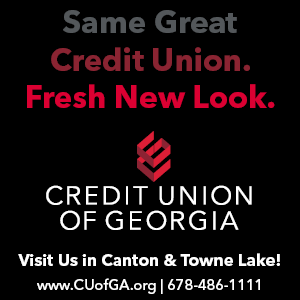 Meetings are on May 14 at CCSD offices in Canton. Learn more here. Please check your school’s website and social media for school event information. 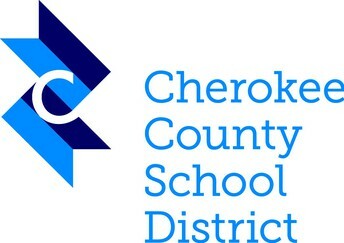 April 11: 6 p.m., Cherokee Arts Center, CCSD Middle School art show opening reception. Admission is free. April 11-13: 7 p.m. nightly and 2 p.m. April 13, Etowah High School, Drama Club’s production of the musical “Beauty and the Beast.” Admission is $10; $5 for children 12 and younger. April 11-13: 7:30 p.m., Woodstock High School, Drama Club’s production of “You Can’t Take It with You.” Admission is $8; $5 for students/senior citizens. April 18: 7 p.m., School Board Auditorium at Dr. Frank R. Petruzielo Educational Services Facility, Cherokee County School Board Meeting. April 25: 6 p.m., Cherokee Arts Center, CCSD High School art show opening reception. Admission is free. April 27: 11 a.m. – 2 p.m., River Ridge High School, Cruise the Ridge Car Show benefitting the RRHS Band Program.